Confirmation bias is a human problem – especially in organisations with a political or ideological agenda. Not surprising then to find it rampant among those opposing fluoridation. It sticks out like the proverbial when opponents of community water fluoridation claim the practice causes a decline in child IQ. That debate is raging at the moment because a recent New Zealand paper (Broadbent et al 2014) showed no effect of fluoridation on IQ. Anti-fluoridationists are doing their best to discredit the study because they hang their argument on a meta review (Choi et al 2012) which they think shows that fluoride in drinking water reduces child IQ. I will leave analysis of the arguments being used against Broadbent et al’s paper for another article. Here I just want to comment on some of the data revealed by Choi et al’s review. In Quality and selection counts in fluoride research I criticised the poor quality of the articles used in the review. However, one stood out as practically the only exception in that it did consider some confounding factors. This is Xiang et al (2003). Mind you he covers up the fact that Xiang’s work considered fluoride concentrations in drinking water higher than that used in community water fluoridation. Connett’s confirmation bias in action I guess. Still, Xiang et al 2003 did report reduced IQ for children drinking well-water with higher F concentrations – their data is summarised in the figure below. This may not be relevant to community water fluoridation but neither is it proof that somehow fluoride can directly affect IQ at higher concentrations. The authors did consider (to a limited extent) confounders such as child age, family income, parental education, urinary iodine and (in a later paper) blood lead and found no influence levels. But they seem to have just ignored a very obvious confounding factor – the influence of a physical defect (in this case bad teeth resulting from severe dental fluorosis) on learning. The same group extended their study (just 2 villages were involved) to dental and skeletal fluorosis – big problems in this region of China. 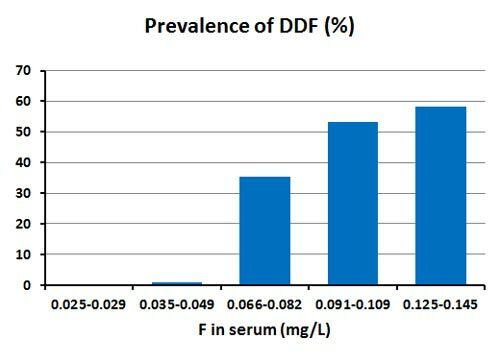 Here is the data for “defect dental fluorosis” DDF, which is “severe” dental fluorosis and some “moderate” dental fluorosis form the more commonly reported Dean’s classification of dental fluorosis. This is for the same children as the IQ study but reported separately (Xiang et al 2004). Incidentally, these authors also looked at adult skeletal fluorosis in the same two villages and reported its occurrence (mainly the Grade II mild form) in the high fluoride village (Xiang et al 2005). These results aren’t surprising – drinking water appears to be the main dietary source of fluoride in these villages so we should expect severe dental fluorosis to correlate with fluoride concentration in the drinking water. The authors did not find a relationship of IQ with parental education, family income or serum lead levels which are known factors influencing IQ they did find it with fluoride where no clear direct mechanism is known. I suspect, though, if the authors had bothered considering a model where a physical defect like dental and skeletal fluorosis could lead to decreasing IQ they would have found a relationship. I say this because minor physical anomalies are known to be associated with learning difficulties and emotional illness in children (see Hilsheimer & Kurko 1979). It seems entirely reasonable that a physical anomaly like severe dental fluorosis could lead to learning difficulties in children which could be seen as lower IQ values. A pity the authors just didn’t think to check for such a relationship – because they had the data. They had a preconceived model of fluoride in drinking water somehow influencing IQ directly. Even worse, the literature has now become so contaminated with the “fluoride causing IQ decline” story it is extremely difficult to find data where research have directly considered the influence of dental and skeletal fluorosis on IQ and learning difficulties. Oh well – this whole story is not relevant to New Zealand or the issue of community water fluoridation. We just don’t get severe dental fluorosis here and fluoridation has only been connected to the very mildest forms of dental fluorosis. However, the propaganda against community water fluoridation and the extreme claims made about the evils of fluoride have diverted attention away from what I think is a very important issue. The problems with learning faced by children with physical anomalies – or even just social anomalies common with socially and financially disadvantaged families. Does water fluoridation improve children’s IQ? If the real lesson of the Xiang et al’s papers is that a physical anomaly like severe dental fluorsis causes learning difficulties it turns the whole story around. The work is being used inappropriately (because of the high fluoride concentrations) as “evidence” against community water fluoridation. But it may instead actually be used to support community water fluoridation. After all, tooth decay is very debilitating for children. It is a physical anomaly which definitely causes a lot of physical pain. But it also causes a lot of psychological pain. It is probably an important negative factor in children’s learning and behavioural problems. I am sure community water fluoridation can make a positive contribution to dental health of our children. But, if this is reflected in reduced learning difficulties, it might also have a positive influence on their IQ. This entry was posted in Health and Medicine, New Zealand, SciBlogs, science, Science and Society and tagged Connett, Dental fluorosis, fluoridation, fluoride, SciBlogs, skeletal fluorosis. Bookmark the permalink. One of the Chinese papers that Choi/Grandjean rejected found that optimal fluoride concentrations was associated with higher IQ. SOURCE: Qin LS, Cui SY. (1990). 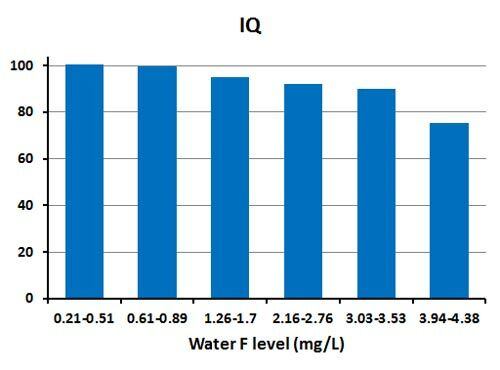 The influence of drinking water fluoride on pupils IQ, as measured by Rui Wen’s standards. Chinese Journal of the Control of Endemic Diseases 5:203-204. Your suggestion that physical abnormality can be associated with IQ deficits is a very reasonable explanation for Qin’s finding. Cavities on one end, severe fluorosis, possibly skeletal fluorosis on the other. I believe that the Qin study was rejected from the meta analysis because it has three groups compared rather than the high-low binary study which the meta analysis sought to evaluate. It has been suggested already this might be as potent a factor as environmental lead.